BEACH Prigi an auction place and fish processing. 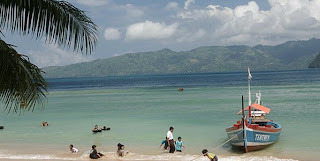 However, thebeach, located in East Java has a unique beauty. Regions Coast Pringi has yellow sand. Regional Government of East Java has been developing this area as the largest fishauction place on the south coast of Java island, so that economicactivity in this area has increased. Around the coast there are many small shops. Although the situation is still chaotic, you are like Javanese food can taste ithere. Some shops even offer a souvenir in the form of the work of the shellfish. Beach Prigi also provides rental boats that will take you around the beach enjoying the scenery around the beaches and cliffs from the sea. Pringi Beach is located at approximately 48 km south of the City Trenggalek, precisely in Desa Tasik Madu, Watulimo District,East Java.